Since DataAnnotations were introduced, developers found an easy way for setting up their database (especially those who use Code First development) while adding at the same time validation logic to their domain objects. In the Web API side, when an object is posted to one of it’s actions, you can check if the object posted is valid with something like this.. While all these sounds great, what happens when you have to add custom validation to your objects? What happens, if you want a User object posted with a FirstName property to be marked as Invalid when it’s first letter is not capital? Can you do this with Attributes? This very question reveals the real problem here, that is it’s not your domain models that needs to be validated but the ViewModel, the one that is transferred between the client and the server. Some times, your ViewModel objects may be the same with your domain objects which is something I always try to avoid. Anyway, I thought it would be good to post about this and make things a little bit clearer for those who are confused. For this solution I chose on purpose not to use custom ViewModel objects so that you can see that model validation can be much more things than database configuration. Let’s start. Suppose that we want to create a Registration form so that user can sign up to our application. Starting from the Domain class library project add the following classes. You can see that I have defined a Gender class which is going to hold only two records, one for Male and another one for Female users. There will be a One to Many relationship between them (not defined yet) and we will declare that SexID will be the User’s foreign key to Gender table. While at the same project, you need to set an initializer class that will always re-create our database, seeding two records for the Gender table. On production projects you will propably need migration logic but this is enough for this post. Now switch to the WebAPI project and for start install Entity Framework through Nuget Packages. Then add references to both of the class library projects. Open Global.asax.cs and add the following line into the Application_Start method, in order to set our database initializer. // Initialize the users database. Adding a connectionString element in to the Web.config file and declare where the database will be created. 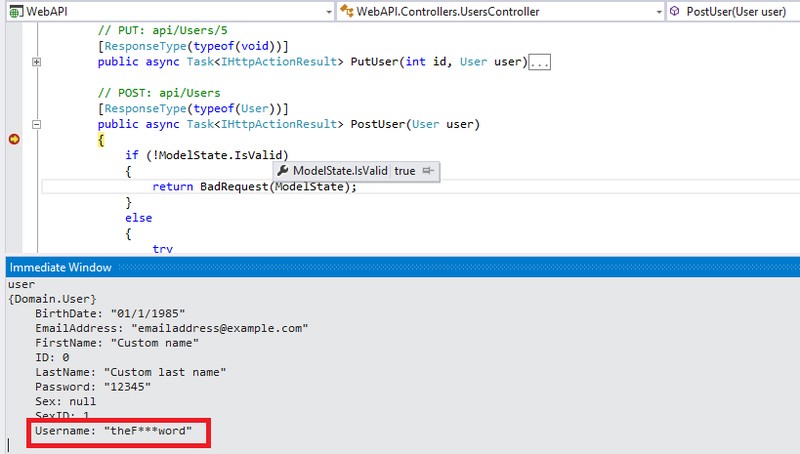 Add a new Web API Controller class named UsersController for retrieving and posting User objects. As soon as we invoke one of this controller actions, our database will be created. Before starting your application you may have to set System.Web.Mvc reference, Copy Local property to True, from the properties window. If you get any errors never mind, you can download this solution from the bottom of this post. We started this post to set custom validations to our object without affecting our database configurations. To check this, create an MVC Controller named HomeController with an Index method. Right click inside the View and select Add view. This will create an Index.cshtml file. I prefer not to paste all of it’s code here since it’s quite big. I will explain though what I did and what I am posting from this page. You can create your own implementation for this or just open the attached solution at the bottom of this post. I have created a registration form using AngularJS and Bootstrap which simply posts form values to our UsersController post method. It’s time to setup the Validation logic. We saw that the User.Username property has been created from Code First configuration as an [nvarchar(100), not null] property in the database. 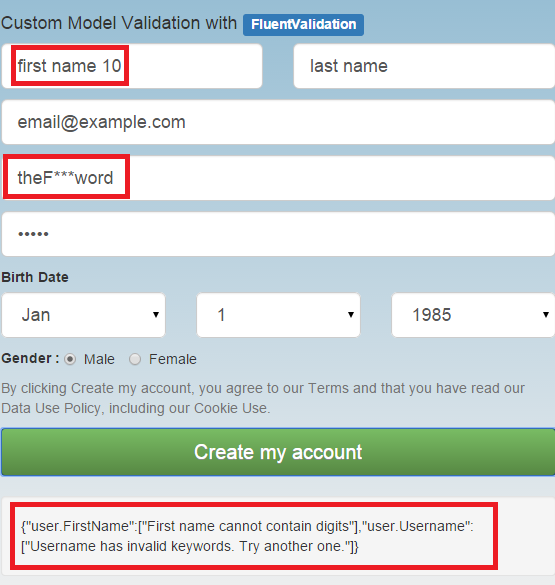 Hence, if the user selects a username with inapropriate or offensive words, the username of course will be valid and the stored in the database. Add a UserValidator class that inherits the AbstractValidator class. I have highlighted only the validations added for the username. I added some more for other properties so you can study them later. 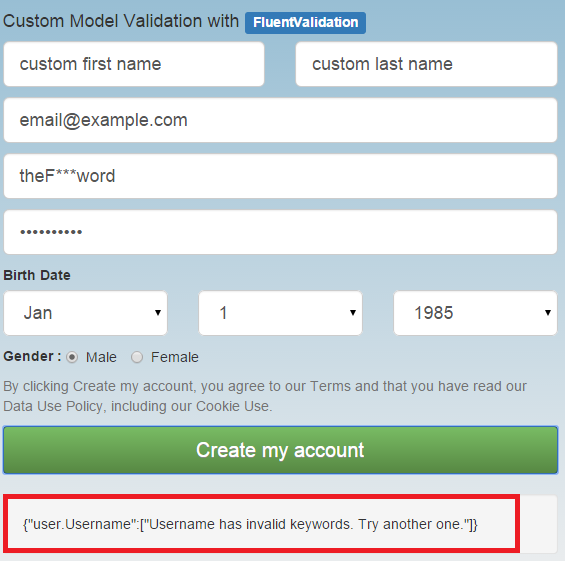 I declared a Rule for the username property which says that userame must not be offensive and if so, return the relative message. 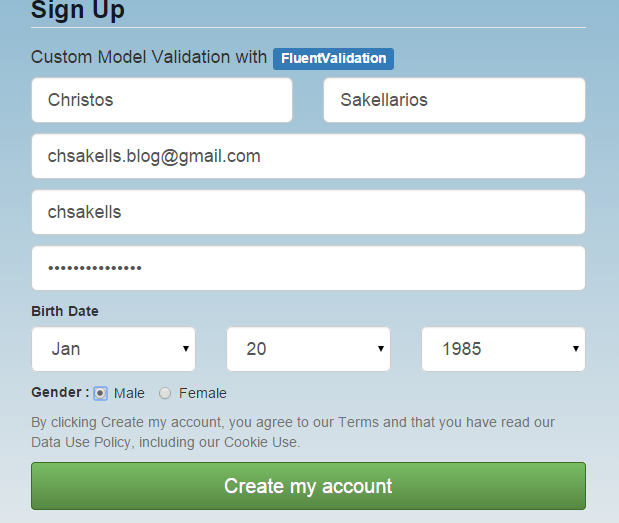 You need to attach the validation configuration to the specific object you want to validate, that is the User class. This is the updated version. You can see how many we can achive using FluentValidation. In the solution you will find that I defined that First name cannot contain Digits and if so return an appropriate message. The reason I decided not to use custom ViewModel objects is to highlight the opposite: That is validation logic shouln’t necessary depent (only) on domain/entity objects but also in custom ViewModel objects. You can create custom lightweighted ViewModel classes for exchanging data between client and server and only if their ModelState is valid procceed to further processing. This way you prevent useless interaction with your database repository. In the next two 2 posts we will see how to create a full functional SPA application using AngularJS and pure Web API. Make sure you follow this blog in order to get notified when this occurs! You can download the project we built from here. Really nice article, thank you very much! p.s. Do you consider host your source code on Github instead of Dropbox? Your advice really sounds right so I will be hosting my source code on Github from now on. Thanks a lot! Just to be clear, I meant, would you have the Domain class library reference the Data Access class library?